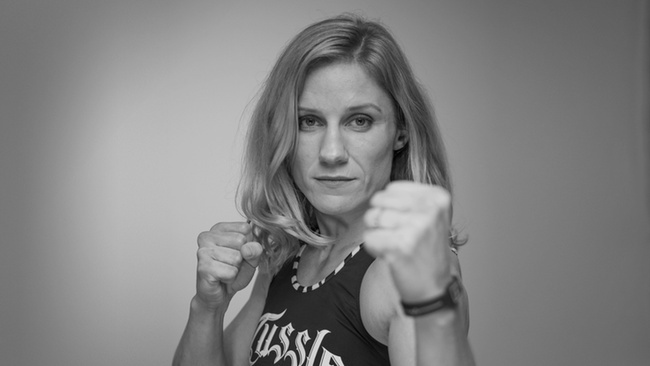 Barb Honchak is an American professional female mixed martial artist. She is the first Invicta FC Flyweight Champion. She has four wins in the Invicta FC promotion and holds notable victories over Vanessa Porto, Roxanne Modafferi, Leslie Smith and Felice Herrig. Honchak is currently the #6-ranked pound-for-pound female MMA fighter in the world by MMARising.com and the #1-ranked 125-pound female fighter according to the Unified Women’s MMA Rankings. Honchak went 8-1 as an amateur mixed martial artist and made her professional debut on November 28, 2009. In her fourth professional fight, Honchak defeated Felice Herrig at Hoosier FC 6 on January 14, 2011. Honchak won three more fights in 2011, defeating Amber McAvoy and Nina Ansaroff by decision and Roxanne Modafferi by submission due to a rear-naked choke. Honchak made her Invicta Fighting Championships debut on July 28, 2012 at Invicta FC 2: Baszler vs. McMann. She defeated Bethany Marshall by TKO in the second round. On October 28, 2012, Honchak faced Aisling Daly at Invicta FC 3: Penne vs. Sugiyama. She defeated Daly by unanimous decision. The victory over Daly earned Honchak a shot at the inaugural Invicta FC Flyweight title on April 5, 2013 at Invicta FC 5: Penne vs. Waterson. She defeated Vanessa Porto by unanimous decision to become the first Invicta FC Flyweight Champion. Honchak faced Leslie Smith at Invicta FC 7: Honchak vs. Smith on December 7, 2013. She successfully defended her Invicta FC title, winning via unanimous decision. Honchak faced Takayo Hashi at Invicta FC 9 on November 1, 2014 and successfully defended her title with another unanimous decision victory. Honchak has a bachelor’s degree in molecular biology and her Master’s in both Ecology and Genetics.